The new year is here and so is a new batch of Simplistic Reviews Movie Commentaries! We start this new year off with a film from 90's action star and serial eater, Steven Seagal. Which Seagal film? 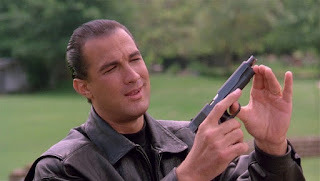 Well, since Steven has a large collection of so bad its good, we figured we get out one of the better Seagal films that also has some of our favorite lines. Stay warm with the boys from SR on this chilly January Sunday and let's watch some Hard to Kill! When police detective Mason Storm (Steven Seagal) uncovers ties among corrupt cops, the mob and charismatic politician Vernon Trent (Bill Sadler), a hit is ordered on his family. During the attack, Storm's wife is killed, and the cop himself is severely injured. After waking up from a years-long coma, Storm, aided by gorgeous nurse Andy Stewart (Kelly LeBrock), slowly gets back on his feet and plots revenge against those who wronged him, particularly the duplicitous Sen. Trent.